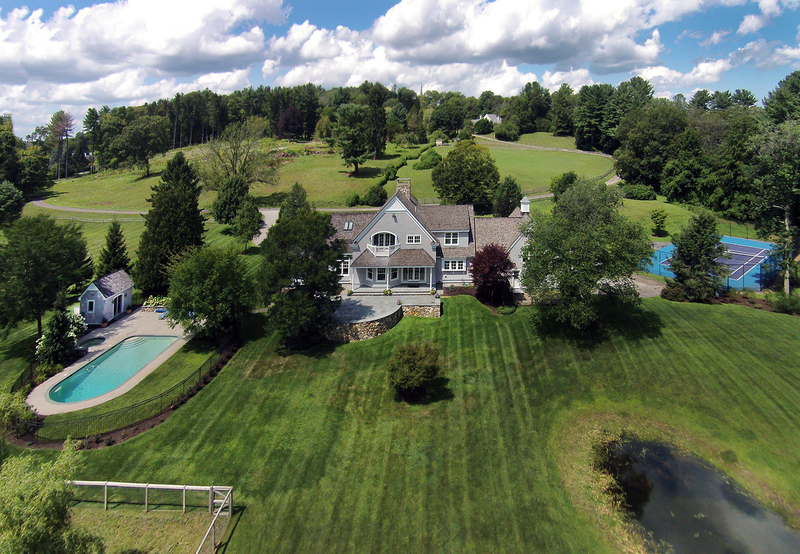 Exceptional craftsmanship and setting for this shingle style Hamilton, Massachusetts estate. With a near complete renovation in 2015 that offers a more contemporary style, this home is ready to be lived in and enjoyed. The pastoral views of the property can be enjoyed from almost every room in this resort-like setting. 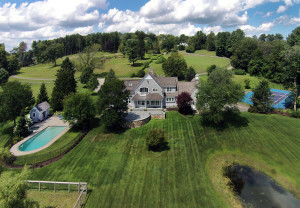 The private enclave, set well off scenic Miles River Road, with 13 +/- acres is approached by passing century old stonewalls and through stone columns into the courtyard style drive. The grounds are attractively manicured and include outdoor lighting and irrigation. The home is well designed for both large and small scale entertaining and quite comfortable for everyday living. Entering the house through the front foyer is through a double height reception hall, the formal dining room with a wood burning fireplace on one side and an inviting and impressive living room beyond and out to the large patio. The chef’s kitchen with a Wolf® range and Sub Zero® refrigerator has a generous, comfortable dining area, center island and breakfast bar. The counters are a fabulous leathered granite. The mudroom is well planned off the kitchen and family room, with an adjacent tiled laundry room and half bath and provides convenient access to the lawn, pool and cabana, pond, tennis court, and garden. Just off of the far end of the living room, with coffered ceilings and fireplace is a private den or office that has a gas fireplace and overlooks the back yard. There is a welcoming first floor ensuite guest bedroom that can also be used as a first floor master bedroom if preferred. Head up the stairs and find the sumptuous and spacious Master Bedroom suite complete with sweeping views from the balcony, and a walk-in closet/dressing room well lit with skylights. The tiled master bath has two vanities, and a large walk-in shower. Also on the second level are two additional bedrooms, one of which is en suite. There are eleven rooms with about 5,305 square feet of living space and an excellent balance of open and private space. With a total of four bedrooms, two half and four full bathrooms there. There are striking finished and detail with coffered and tray ceilings, detailed trim work and quarter sewn oak floors throughout most of the home. Other extras include a heated three car garage on the first floor level, dehumidifying system, security system, water filtration, NEST® system, and SONOS® entertainment system. This property has has been renovated by local master builder Jeff Lawler of County Homes. This home is convenient to Boston and recreational activities on the North Shore and Cape Ann.